One would have to be a fresh-off-the-boat international correspondent to be fooled by the pitiful attempts to stage “pro-Mubarak protests” on the streets of Egypt today. Egyptians know these people too well. It’s always the same middle-aged men with death in their eyes. Most of them dress casual; not too shabby, but nothing fancy either, for their Interior Ministry paychecks are nothing to brag about. If any of them ever believed in what they were doing then the look in their eyes shows that such illusions have long vanished. They always arrive in coordinated groups just in the nick of time to stage a “pro-government protest” wherever an actual protest has been planned. They are often armed with sticks, and sometimes stones, and their usual role is to beat people with impunity. Today these state security goons were ordered to appear on cue to cheer Mubarak’s pre-recorded speech on the streets of Alexandria, Suez and Cairo. 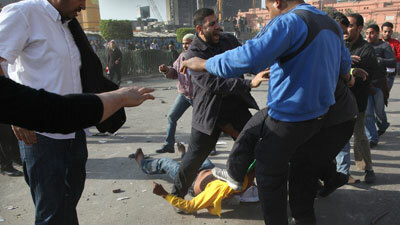 In Alexandria they attacked the crowds who had amassed in Mahatit Masr Square with stones, and the crowd fought back. To break up the fight two army tanks drove between the groups and fired shots in the air. The “pro-Mubrarak protestors”, outnumbered and fearful of the army, withdrew. We have not yet had confirmation, but it appears that something similar occurred in Suez. However, contrary to reports in the international media, the goon squad never got to Tahrir square in Cairo today. The estimated three hundred of them, many arriving on motorcycles, were no match for the thousands who had remained in the square following this morning’s two million strong rally. Nonetheless they tried to access the square twice, once coming from Talat Harb, just as the speech began, and once from Qasr El Ainy street. Both times they were successfully stopped by blockades of soldiers and citizens. Meanwhile Mubarak’s speech, which people watched on a giant screen that had been set up in the square, was greeted with fury by the crowds, who hurled projectiles at the dictator’s face. In addition people from all around the neighborhood who had seen the speech on TV came flooding back to the square in earnest, chanting “leave, leave” and “get out”. Mubarak’s desperate attempt at derailing the movement by tempting people with his future retirement has only hardened the resolve of protestors and reinforced the numbers who are camping out here. People now say they are refusing to leave until the whole government resigns. Whoops, from Occupied London.. link added..